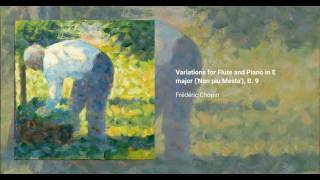 The Variations for Flute and Piano in E major were written around 1824 and are usually attributed to Chopin, though some questions have been risen about their true authorship. 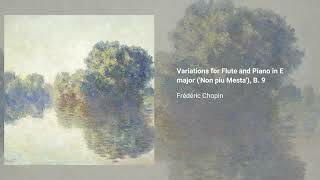 The work consists on a theme exposition followed by 3 variations. The theme is based based on a melody off 'Non Piú mesta', from Rossini's La Cenerentola. As they were published posthumously (in 1955), they don't have an opus number, and they are usually referred to by their Brown catalogue number, B. 9.